Jeremy Hunt has told NHS hospitals they must get back to meeting the target for seeing patients swiftly in A&E. In a speech on Thursday, the health secretary said it was "critical for patient safety". The target of seeing 95% of patients in four hours has been missed in England since July 2015. There was a record low of 85.1% in January. Mr Hunt demanded progress this year and said the target should be hit next year after new funding in the Budget. Chancellor Philip Hammond announced an extra £2bn for social care over the next three years. This comes after warnings services were under threat with councils, which are in charge of services, reportedly £1bn short of the £19.7bn they need this year. Mr Hunt said the new money would help tackle the problem of patients who were fit to leave hospital having discharge delayed because of a lack of suitable care in the community. This is thought to have contributed to overcrowding in trusts. The health secretary said: "It is absolutely essential we get back to the 95% target. That is critical for patient safety." To coincide with Mr Hunt's speech, bosses at NHS England and NHS Improvement, which run the health service, wrote to hospital chief executives giving them a deadline of March 2018 to get back on track. They said the social care money would play an important part in relieving the pressure as it could help to free up between 2,000 and 3,000 beds which are occupied by patients who have finished their treatment. If this is achieved it would represent a halving of the delays that are currently being seen. 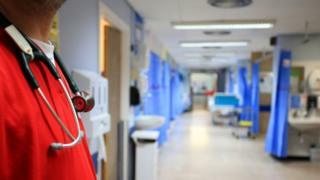 The development comes after ministers and NHS bosses have given serious consideration to dropping or changing the target. Earlier this winter Mr Hunt suggested it was being looked at amid concerns the growing numbers seeking care at A&E units was making it very difficult for hospitals to hit the target. Chris Hopson, of NHS Providers, which represents hospitals, said: "Given how far we are currently behind the target and without the required funding we think it is unrealistic to expect trusts as a whole to meet the 95% A&E target within a year."